Pack4DreamHack is more than just a roadtrip to a wonderful event in a “faraway” country. Over the years our little journey has transformed from just a random bunch of gamers into a friendly community. Every edition we’ve made a lot of new friends, some of which who have become regular Packers. This community with faces old and new is what makes Pack4DreamHack unique and why we love organizing this grueling roadtrip. Having our very own row at DreamHack to share with enthusiastic gamers and friends is worth the sleeplessness. Unfortunately for this Summer’s edition we have to refer back to this line. We hoped we did not have to write this newspost, but seeing as Pack4DreamHack is a community-driven event we have to inform our fans and Packers about our decision. 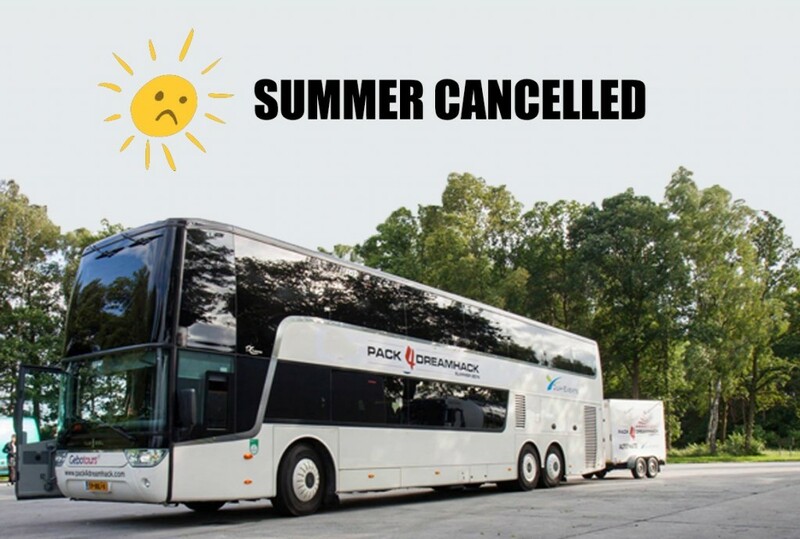 Due to not having enough sign-ups for this Summer’s edition we have to cancel the trip to DreamHack in Sweden. We understand the motivations of potential Packers for not joining this summer (school, unexpected expenses, private matters) but we hope to see all these wonderful people back for the Pack4DreamHack Winter 2017 edition of our event. Packers who did sign up for the summer edition will be contacted to discuss about options for reimbursement or saving a seat this winter. We hope you understand the predicament we as organizers are in. In the meantime we’ll be hard at work with making sure our Winter 2017 edition is going to be as great as what you’re used to from us. Thanks for reading and for your understanding. Have a great summer and we love to see you all back in November when we hopefully once again depart for DreamHack. Tickets for the Winter edition of 2017 can be bought on our ticketpage. Interested in our event or already planning to go? Keep a close eye on our eventpage on Facebook. Vervelend om te horen! Ik ben inderdaad aan het afstuderen deze zomer waardoor ik niet kan aansluiten. Van de winter ben ik wel van plan om mee te gaan! Hopelijk hebben we dan genoeg man, want het blijft een te gek event!